I am so happy to be part of the KTEC family again! It is such an honor for me to be at such a wonderful school with great students, parents and staff! I am looking forward to having your child in choir class this year. I want to share my love of singing and passion for music. Being part of a choir is not just about singing, but about working together as a team, learning how to listen to each other, building self-esteem, and respect for one another. 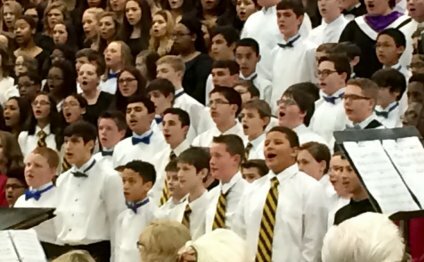 Being involved in choir also awakens imagination, opens the mind and activates the body. I have a very exciting year planned for our students and have selected music, warm-ups and sight-reading activities that will be both challenging and fun! All 6-8th grade students will only have one required choir dress rehearsal and choir concert this year. Any and all choir information and news will always be posted on the KTEC Choir Webpage. I would also like you to please take a moment to fill out my Parent Survey. This survey will help me find out who may be interested in volunteering, chaperoning, videotaping, and/ or helping with any choir activities this year. You do not need to print or send in the survey to school, just fill out online and hit submit!